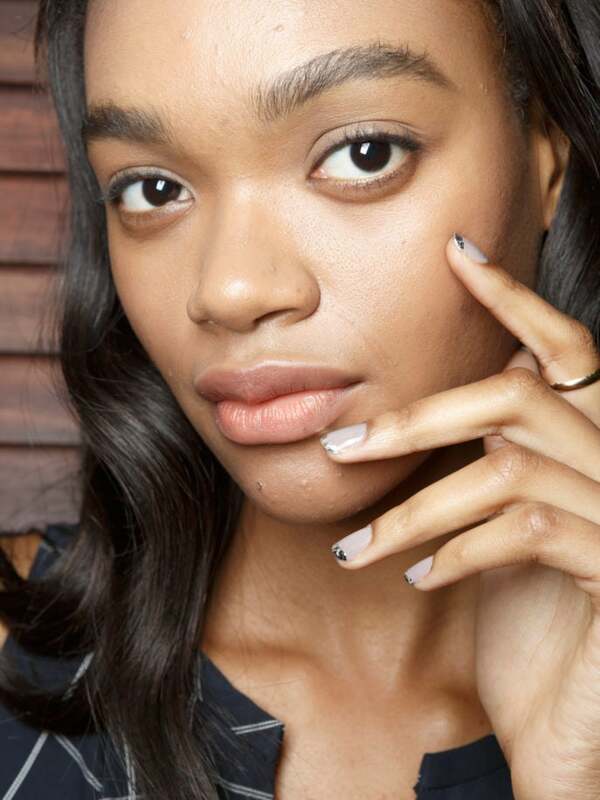 Though we won’t be able to get our hands on most of the pieces taking the NYFW runways until next spring, we’re already itching to recreate the bold nail designs right now. Glitter-coated cuticles, a la Jeremy Scott, may not be the most practical look for your office job, but we’re definitely big fans of the matte neon lacquers each of the girls wore with the equally-vivid designs. The tweed-printed talons at Christian Siriano were just as enviable. 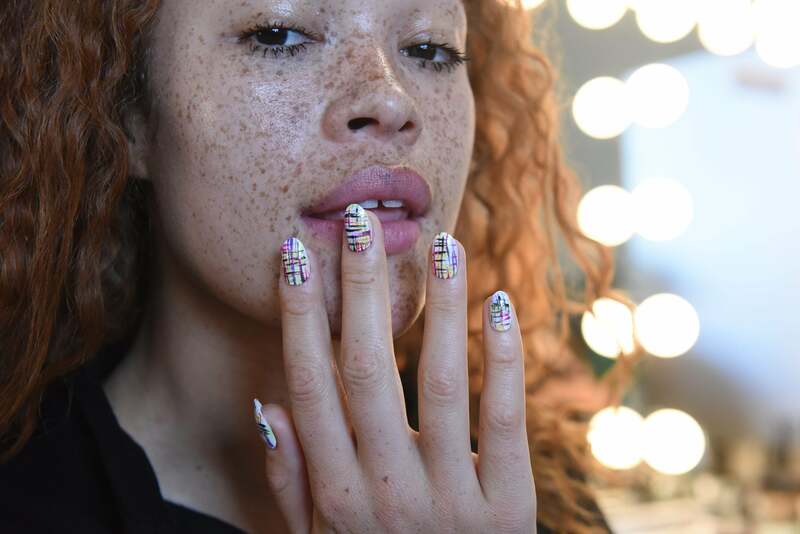 “Nail art isn’t just for special occasions, it can be part of your everyday look,” says lead manicurist Gina Edwards, who used KISS products to create the pattern. 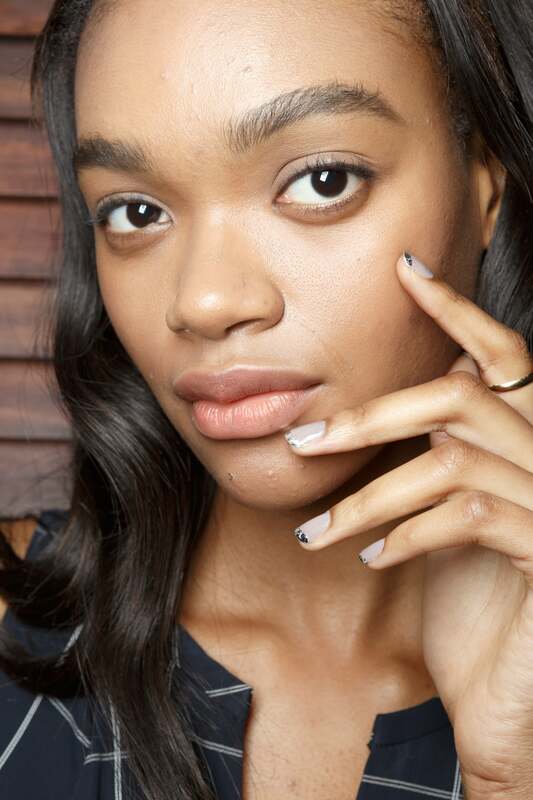 Here, we put together a list of the best manicure moments from New York Fashion Week so far. To complement the aquamarine eyes created by MAC artist Pep Gay, small yellow glitter stars adorned each girl's bare nails. 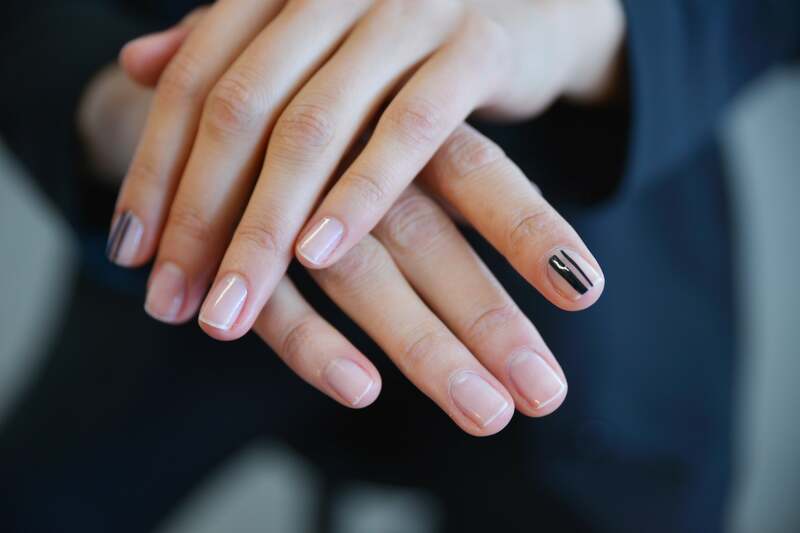 Manicurist Jin Soon Choi lacquered each girl up with bold stripes on a single nail, and a clear coat on the rest of the fingers. 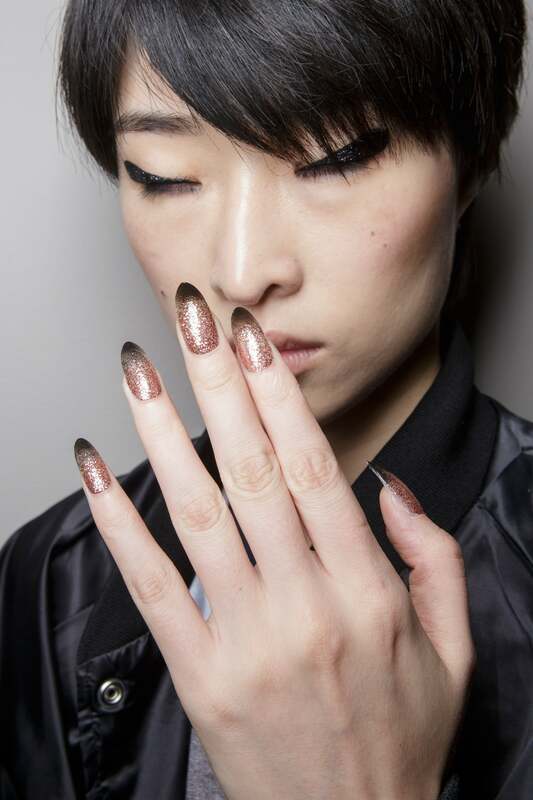 Smoky noir tips contrasted against a rose gold glitter base. Oversized gems gave the patent leather lacquer a 3D effect. 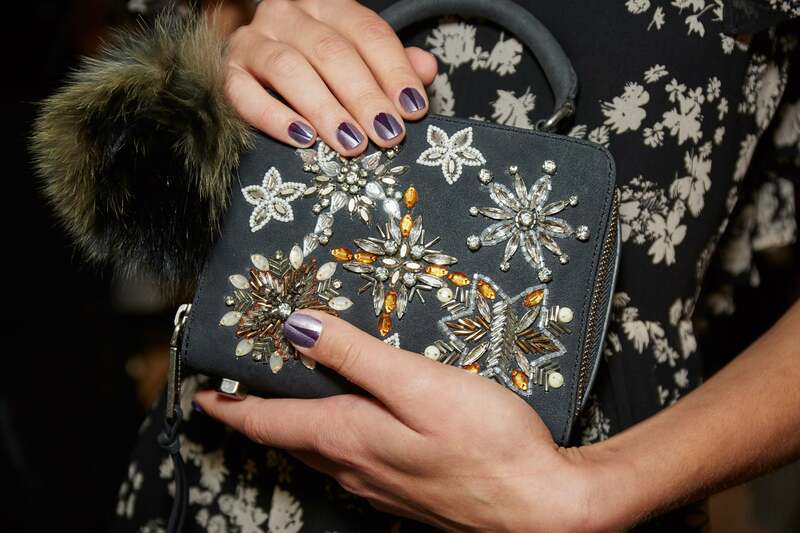 Models at Sachin & Babi made the French mani cool again by pairing a foiled tip with a dusty lavender base. Glitter around the exterior of the nail is still considered nail art, right? The unexpected accent was almost as bold as the neon CND lacquers on each of the models' talons. Rose gold polish was swept on in a retro half-moon, leaving the base of the nail exposed. 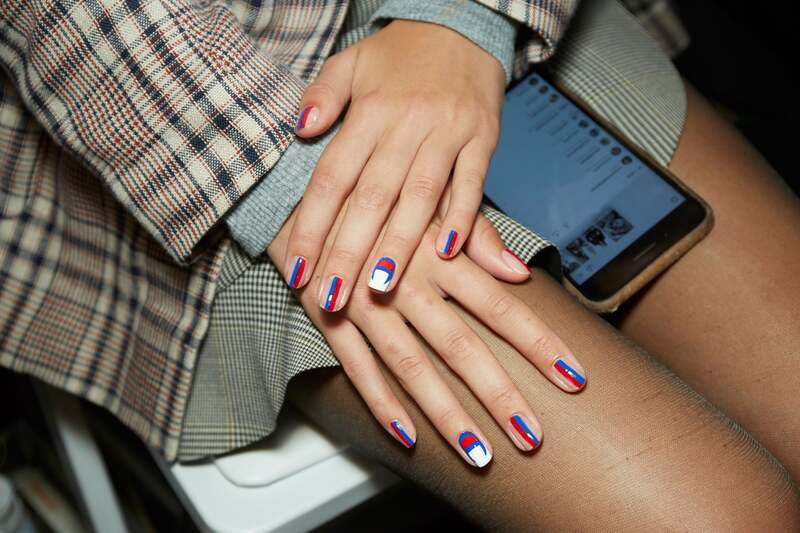 Using the red, white, and blue color scheme from the Champion logo as inspiration for the statement nail, manicurist Alicia Torello applied a layer of Essie's Blanc, then used the brand's Really Red in tandem with Butler Please ($9 each; ulta.com) to create the iconic C shape around the border. She followed by applying stripes in the red and blue tones to the remaining fingers. 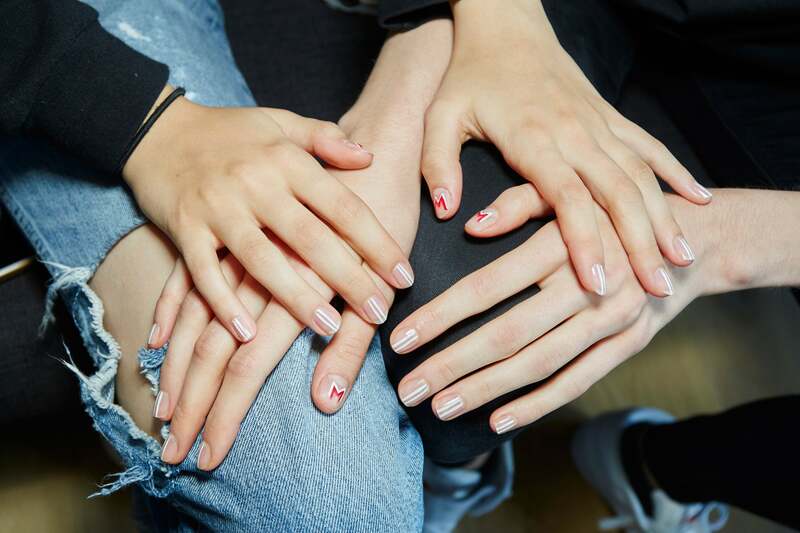 Manicurist Rita Remark painted on two thin stripes of Essie's Blanc to each nail, and in the middle of each thumb, used the same white hue outlined with the brand's Really Red color ($9 each; ulta.com). Manicurist Gina Edwards used a striping brush to paint a multicolored tweed pattern over the Kiss imPRESS Press-On Manicure in Flash Mob ($6; walmart.com), which she used as a base. 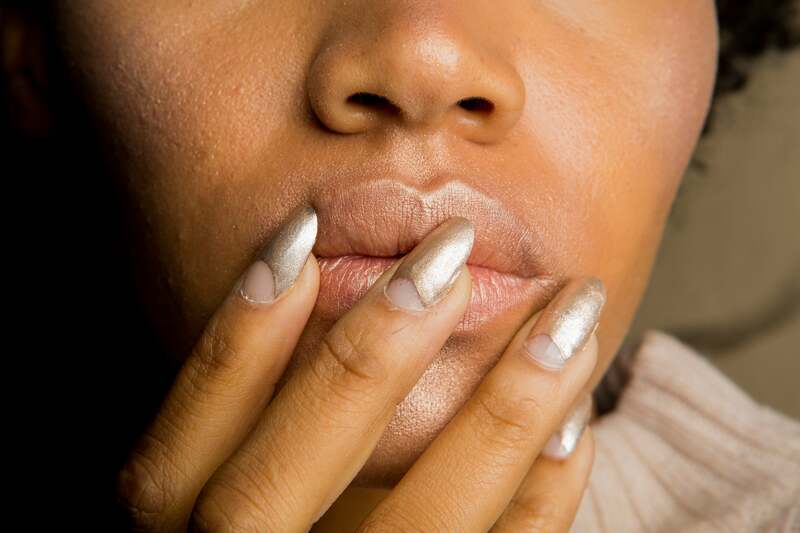 Lead manicurist Michelle Saunders applied a coat of Essie's Dressed to the Ninteies down the center of the nail, spanning from the cuticle to tip, then followed with the brand's Girly Grunge hue ($9 each; ulta.com) along both sides, angling the metallic hue inward as she reached the top.